My wish came true! 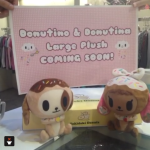 The pastry puppies are getting full size plush releases from tokidoki. There’s no release date yet, but it can’t be too long since the photo shows what seem to be finished products.